This is a top quality spiny trilobite fossil. It is a fabulous Quadrops flexuosa from the Devonian of Morocco. This trilobite required meticulous preparation under a microscope (it takes longer to prepare a Quadrops than almost any other trilobite in the world.) The trilobite was prepared in 1996 and was just recently acquired from a major fossil collection. 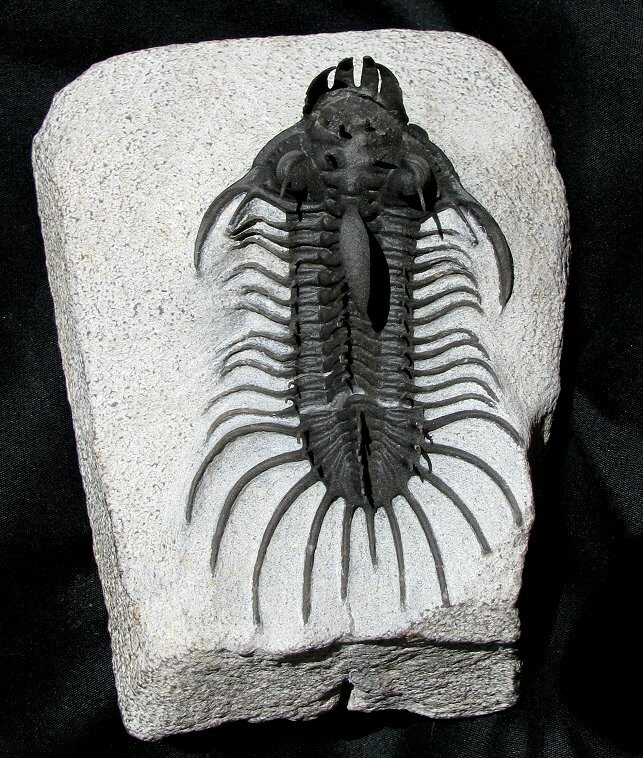 Quadrops is one of the most spiny and prized trilobites in the world. This distinctive specimen boasts over 40 free-standing spines, and the long occipital spine and famous four-pronged snout are both intact and also fully free of matrix. The long genal spines and the distinct pleural spines are also beautifully preserved. The detail is spectacular, including the "perfect" compound eye facets! The natural black coloration is strikingly beautiful. And the bug is over three and a half inches long - a HUGE example! This is easily one of the best display Quadrops we have ever had.